Eddie Roberts is at it again. 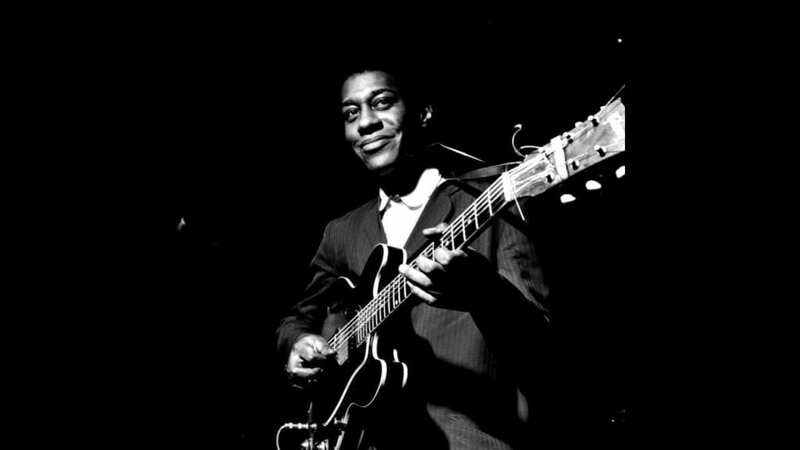 His love for guitarist Grant Green is taking him to Colorado this week, and it is perfect timing. How can you do better than a reprise of Green is Beautiful on Earth Day? 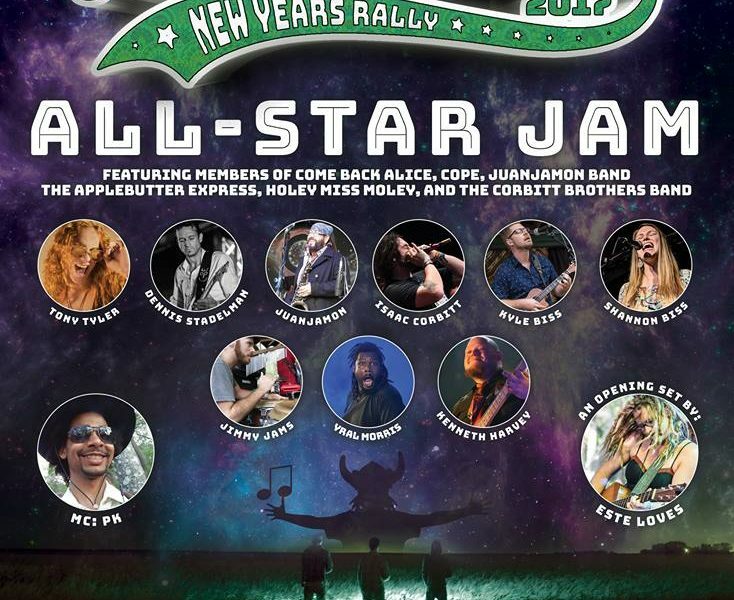 Actually, Eddie and crew are playing three shows, starting Thursday, April 20, at Shakedown Bar in Vail, followed by two nights in Denver: Friday at Cervantes Other Side and Earth Day Saturday at Ophelia’s. Roberts first put together a Green is Beautiful tribute at Bear Creek Bayou in New Orleans last October, and it was brilliant. [And yes, I missed the three extra hours they played when they moved over to The Maple Leaf.] This time, the New Mastersounds guitarist has assembled another great band. 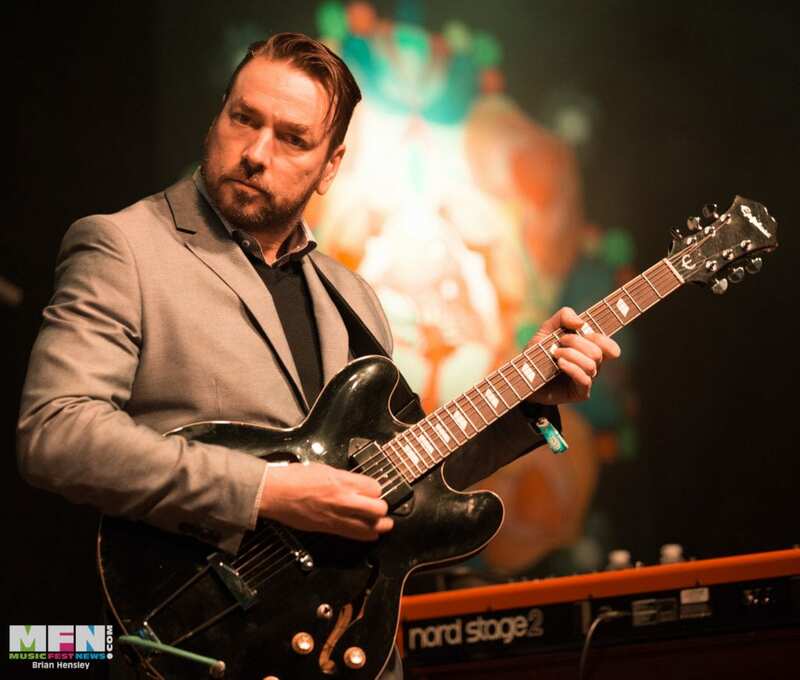 Alan Evans, who drums for Soulive and Karl Denson’s Tiny Universe, joins him, along with Chris Spies, Hammond B3 organ; Alex Scott, bass; and Nick Gerlach, tenor saxophone. 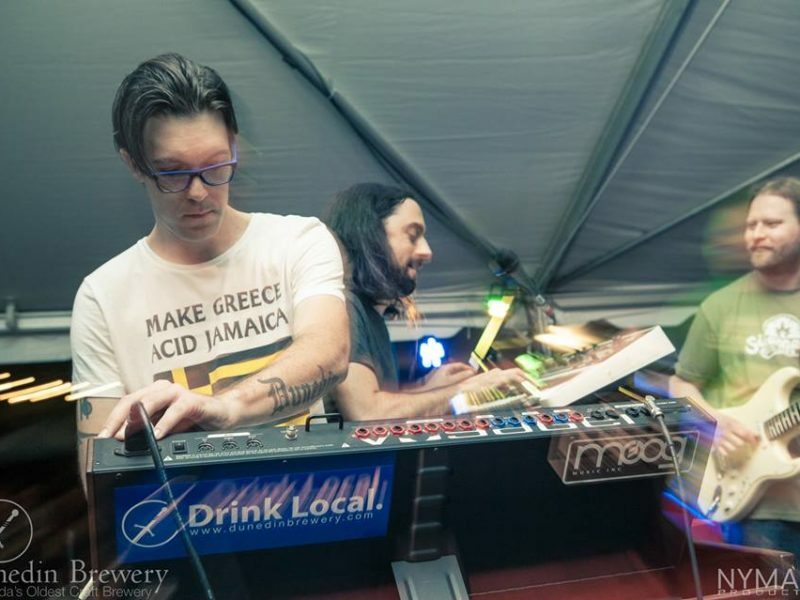 Special guest for the Denver shows will be DJ Marcos Boricua from Madrid. It is my understanding that a writer cannot plagiarize himself. 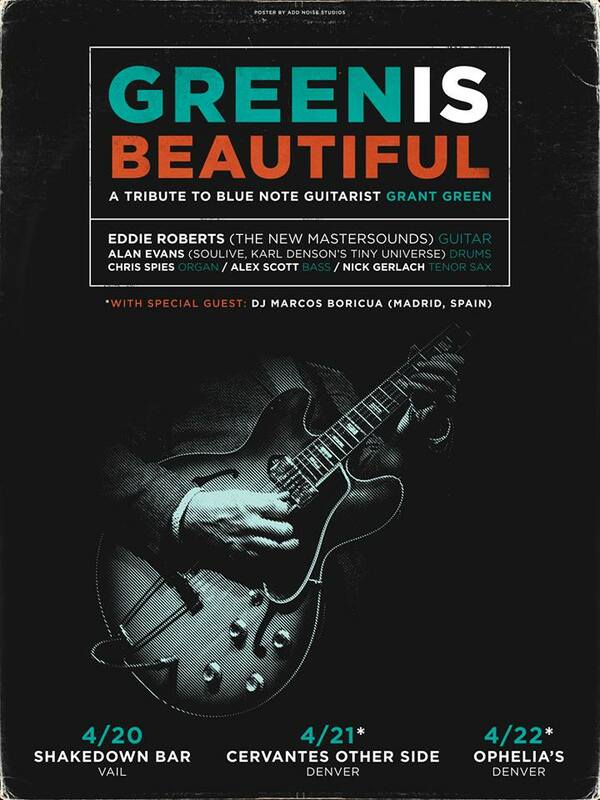 With that in mind, here is why Eddie Roberts, countless others and I love Grant Green and why this is such a special tribute. Who, you might reasonably ask, IS Grant Green? His son, Grant Green, Jr., is a current member of the scene, fluent in jazz, rock, funk and R&B, but right now we’re talking about his dad. 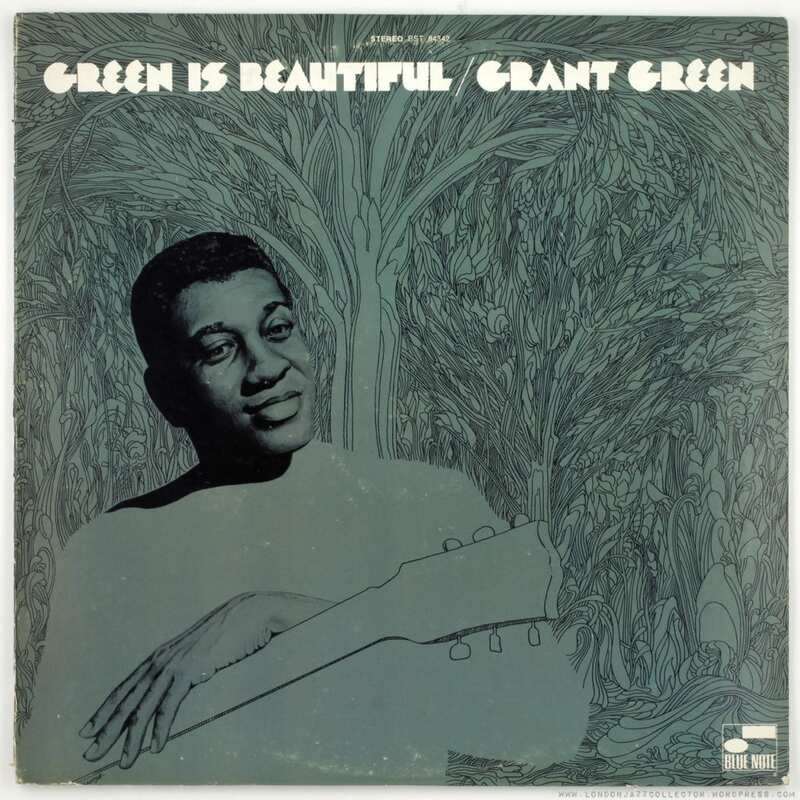 Grant Green was one of the greatest yet largely overlooked jazz guitarists of the ’60s and into the ’70s. 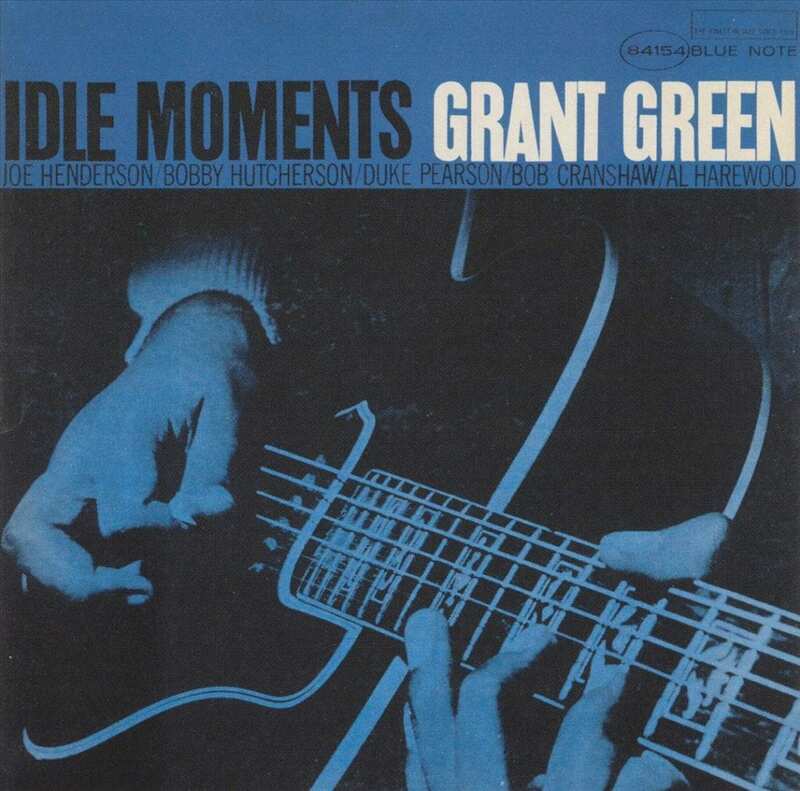 When people discuss that period, it is natural to hear the names of Wes Montgomery, Kenny Burrell and George Benson; Grant Green was simply not a household name, but his star shone just as brightly. Born in St. Louis in 1939, Green was playing out by age 12. He transitioned from boogie-woogie to jazz, listening to Charlie Christian and influenced by saxophone players such as Charlie Parker. If you’ve heard Green, then you appreciate just how much his style and Roberts’ are alike. Green’s Wikipedia entry explains that his playing was “linear rather than chordal” (such as Wes Montgomery’s). With Green, you hear — and feel — every note. Green spent lots of time in organ trios — Hammond B3, guitar and drums — with B3 masters such as Jimmy Smith, Baby Face Willette, “Big” John Patton, Brother Jack McDuff, Larry Young, Wild Bill Davis and Don Patterson over the years. 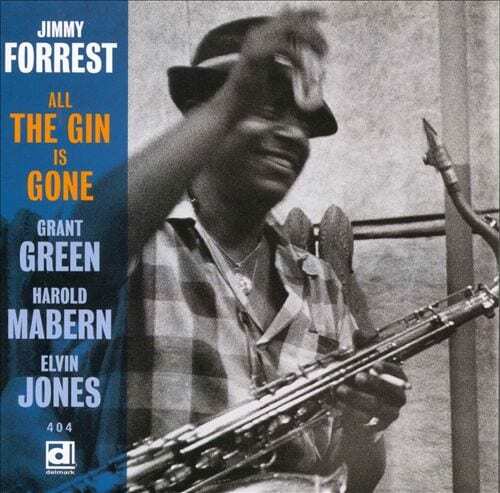 Tenor saxophone player Jimmy Forrest discovered Green and included him on two of his 1959 recordings, Green’s first dates on vinyl. Alto player Lou Donaldson saw him playing in St. Louis and took him straight to Blue Note Records in New York. In his incredibly fertile period from 1960 to 1965, he recorded 22 dates as a leader and 55 more as a sideman, most for Blue Note, with most of the others on Prestige and affiliated labels. He was mostly silent after that time until 1969, when he reemerged with a decidedly more funky groove. He is often regarded as on of the fathers of acid jazz. His last two records were made in 1976 and 1978. Green passed away in January of 1979 after suffering a heart attack. Green’s first date as a leader was shelved until 2001. In fact, ten of his recordings were released posthumously. Even so, those that were issued when they were recorded established his legacy as a superb and very different player. 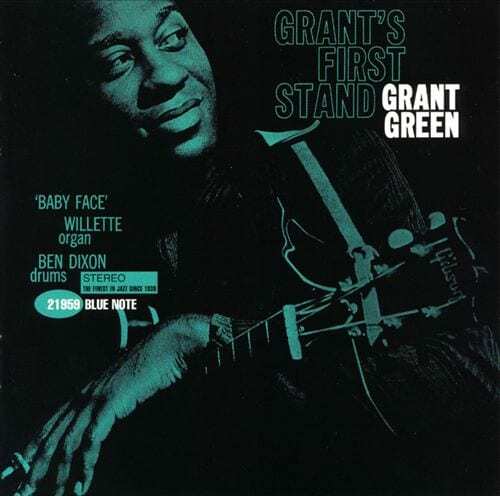 Six titles were recorded in 1961, beginning with Grant’s First Stand and Green Street and including Sunday Morning, a fine album of gospel tunes. 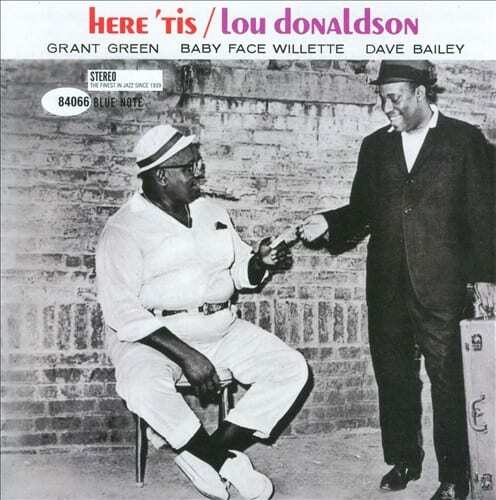 That year also saw him as a sideman on great records by his benefactor Lou Donaldson (Here ’Tis), Brother Jack McDuff (The Honeydripper), Horace Parlan (Up & Down), Stanley Turrentine (ZT’s Blues), Hank Mobley (Workout), and Ike Quebec (Blue & Sentimental). Six more dates were recorded in 1962, with The Latin Bit and Goin’ West heading in different directions. Feelin’ the Spirit was also a ’62 album — more on that in a moment. He also guested with Lou Donaldson (The Natural Soul) and Don Wilkerson (Preach Brother!). One of Green’s true gems was a 1963 date with Bobby Hutcherson and Joe Henderson titled Idle Moments. He recorded on dates with Jimmy Smith (I’m Movin’ On), Herbie Hancock (My Point of View), Mary Lou Williams (Black Christ of the Andes), and a dozen more. Two of Green’s best recordings from 1964 were not released until after his death, Matador and Solid. 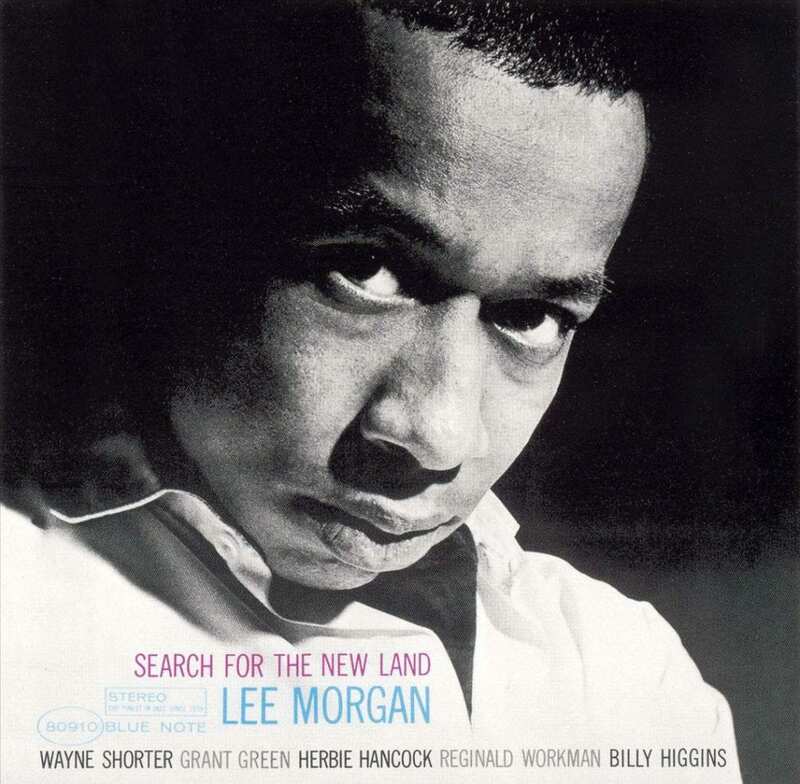 Green played on Donald Byrd’s I’m Tryin’ to Get Home and on Lee Morgan’s masterpiece Search for the New Land (with Wayne Shorter, Hancock, Reggie Workman and Billy Higgins). His dates as leader in 1965 were I Want to Hold Your Hand and His Majesty King Funk. He had a few other dates, including two with Johnny Hodges and Will Bill Davis, before going on hiatus due to health issues, including heroin addiction. The lone recording during this period was Iron City, but that 1967 album wasn’t released on Cobblestone until 1972. 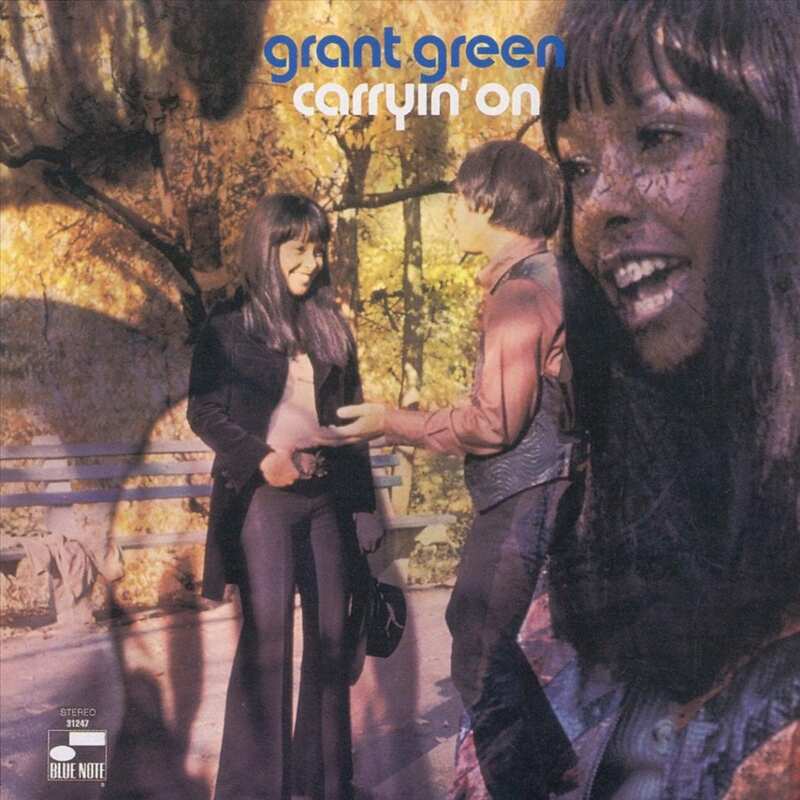 As Green resurfaced in 1969, the change in direction could not have been clearer on Carryin’ On with “I Don’t Want Nobody to Give Me Nothing (Open Up the Door, I’ll Get It Myself).” Others had begun to join jazz and funk, but Green swung for the fences. 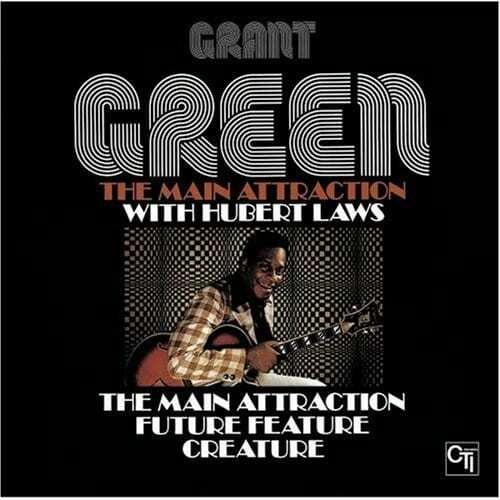 On 1970’s Green is Beautiful, there is a great ten-minute version of “Ain’t It Funky Now.” That same year, Alive featured Kool & the Gang’s “Let the Music Take Your Mind.” And he recorded with Houston Person (and again in 1973). In 1971, Blue Note released its very first movie soundtrack, The Final Comedown, listed as a Grant Green album. Wade Marcus was the composer on all tracks, some of which were funk, others mood pieces. 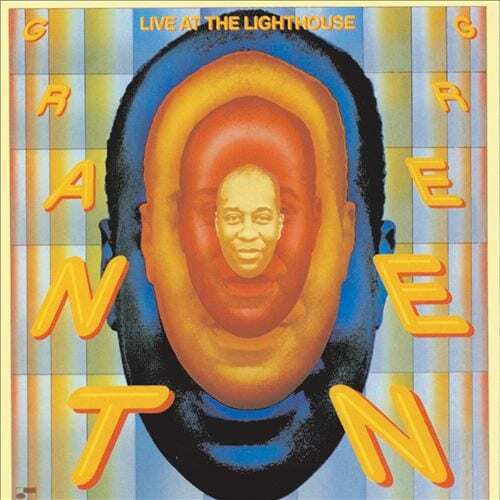 Green’s last Blue Note album, recording-wise, was Live at the Lighthouse, which features an incredible 15-minute version of “Flood in Franklin Park.” His last two albums were The Main Attraction (Kudu, 1976) and Easy (Versatile, 1978). Those later recordings draw mixed reviews, but his playing was still solid Green. I was doing radio at Lehigh University (1969-1973), and in 1970 I “discovered” the huge stash of jazz LPs in the station’s library that nobody was playing at the time. I would grab half a dozen at night, attempt to absorb, then try another half dozen the next night. I remember first encountering “Big” John Patton’s Along Came John. It was the first organ trio I’d ever encountered, and Grant Green’s playing was a revelation. It was shortly thereafter that I ran across Feelin’ the Spirit. That 1962 album is near the top of my desert island list. The track listing is wonderful, the personnel amazing, and the feelin’? Absolutely mesmerizing. 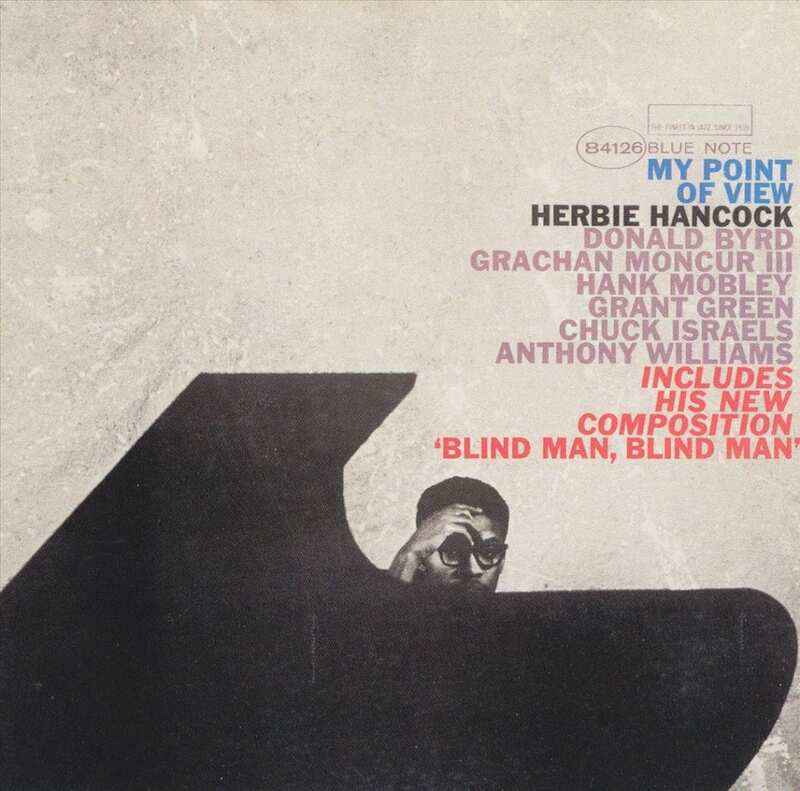 Personnel: Green, guitar; Herbie Hancock, piano; Butch Warren, bass; Billy Higgins, drums; Garvin Masseaux, tambourine. I’ll go one step further. 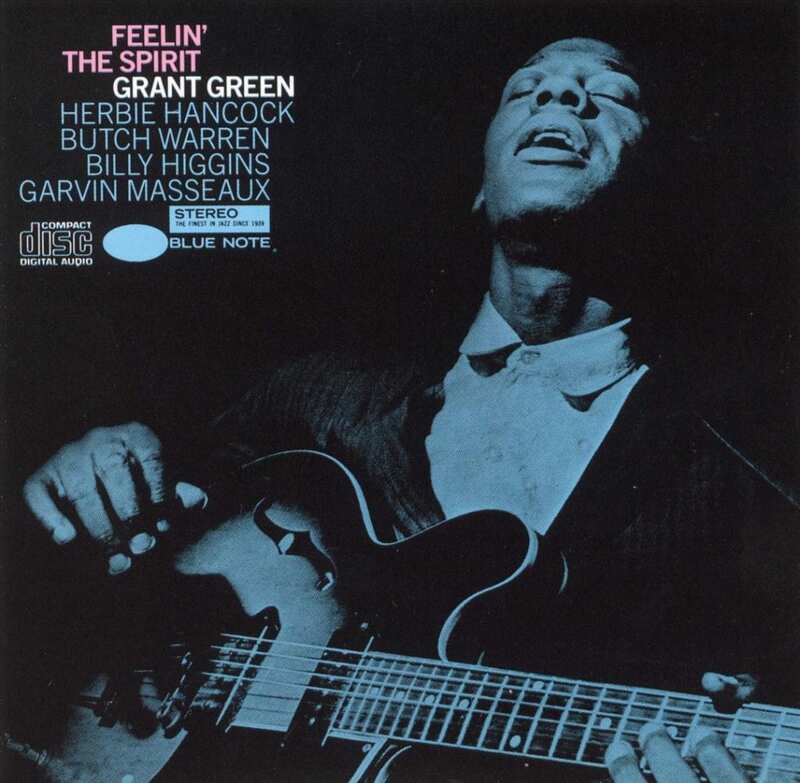 Not only is it my favorite Grant Green album, but it is also my favorite Herbie Hancock album! You need this album; you never know when you’ll end up on a desert island, do you? Thank you, Eddie Roberts, for paying tribute to one of the greatest unsung heroes in all of jazz. Bear Creek Bayou will be the richer for it. This is a link to the great Wikipedia discography. 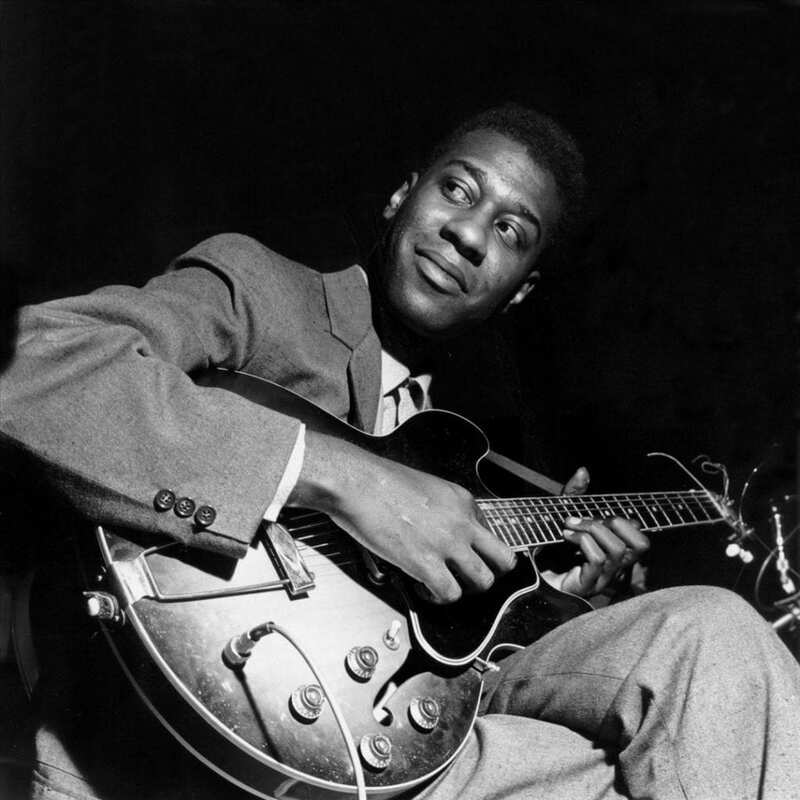 In the meantime, enjoy 50 songs and seven hours of the music of Grant Green!